The One Big Reason Sears Canada Is Failing Has Everything to Do With Sears U.S. Forget the death of malls and the "Amazon takeover," Sears has sucked money from Sears Canada for years. Forget the demise of malls and the "Amazon takeover," Sears Holdings Corp. (SHLD has sucked money from Sears Canada Inc. (SRSC for years and that's why it's going down the toilet. What has drained Sears Canada is the financial arrangement between it and Sears Holdings, in which any money Sears Canada makes is funneled into the separate U.S. company, leaving scant funds for the northern company to innovate, Maureen Atkinson, senior partner at J.C. Williams Group, a global retailer advisor in Toronto, told The Street on Thursday, June 22. That began happening, added Atkinson, when Calvin McDonald was president and CEO of Sears Canada, which was between July 2011 and September 2013, according to his LinkedIn profile. McDonald, who declined to be interviewed for this article, is now president and CEO of Sephora Americas. According to CBC New Business, in 2013 Sears Canada sent about a half-billion Canadian dollars in cash back to the U.S., specifically to Sears Holdings and Edward Lampert, who is chairman and CEO of Sears Holdings, and founder, chairman and CEO of ESL Investments. The payment of some C$5 per share was equivalent to 30% of the company's stock price at the time. "You can't reinvent a department store with no money," said Atkinson. "He [McDonald] actually had a plan. He felt like it [Sears Canada] had a future. Whether he was delusional or not is another story." Antony Karabus of HRC Retail Advisory told TheStreet on Thursday that he agreed with Atkinson's assessment. It has been "death by a thousand cuts. They [Sears Canada] have sold off the furniture to keep the house warm, and they didn't invest in the company." Sears Canada on way out. Atkinson said Sears Canada has been selling off its leases at downtown locations in Toronto and Vancouver, which have been replaced with a Nordstrom (JWN - Get Report) , and in prime suburban locations, and closing other stores. "It [Sears Canada's bankruptcy] had to happen sooner or later. It was a question of when," added Atkinson. "The shopping center owners have been preparing for it for about five years. The vendors have stopped shipping, that's it in a nutshell." 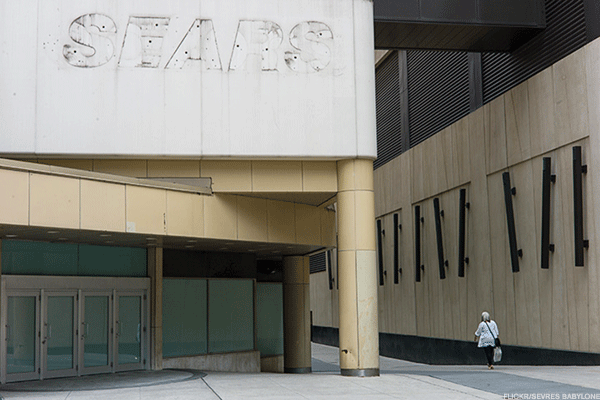 Karabus said Sears Canada was at its peak when it was run by Mark A. Cohen, president and CEO between 2001 and 2004, and had C$6 billion in sales and a half-billion in profits. Total revenue in 2016 for Sears Canada was C$2.6 billion and in 2015, C$3.1 billion. Sears Canada, which sought bankruptcy protection, was granted approval on Thursday from the Ontario Superior Court of Justice for an initial period of 30 days. The initial order also authorizes a stay of proceedings for 30 days, subject to an extension, according to a press release on the company's website. Sears Canada Group will obtain debtor-in-possession financing in the aggregate principal amount of C$450 million with the company's existing ABL lenders, with Wells Fargo Capital Finance Corporation (WF - Get Report) acting as administrative agent, and the loan lenders, with GACP Finance Co. acting as administrative agent. A Sears [U.S.] representative said that Sears Canada is a separate publicly traded company that was spun off from Sears Holdings in 2012. Sears Holdings has approximately a 12% stake in Sears Canada. Sears Canada plans to close 59 more stores, including 20 mainline, 15 Sears Home and 10 outlet locations and eliminate 2,900 positions through its bankruptcy process.